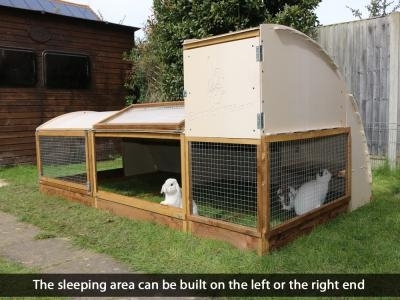 BunnyBunker ‘L’ is like nothing on the market. It provides an insulated sleeping area with 35mm thick walls and access from underneath to reduce heat loss. A full roof gives shelter not just from rain but also provides essential shade for hot summers. Low maintenance is assured by wood/plastic composite for roof and sleeping area and high density, pressure treated timber which is harder to chew and doesn’t need constant treating. Oh, it’s also huge!